Longtime Elk Grove Resident and Councilman Acknowledges City's 'Redneck' Heritage - Time to Rethink City Motto? 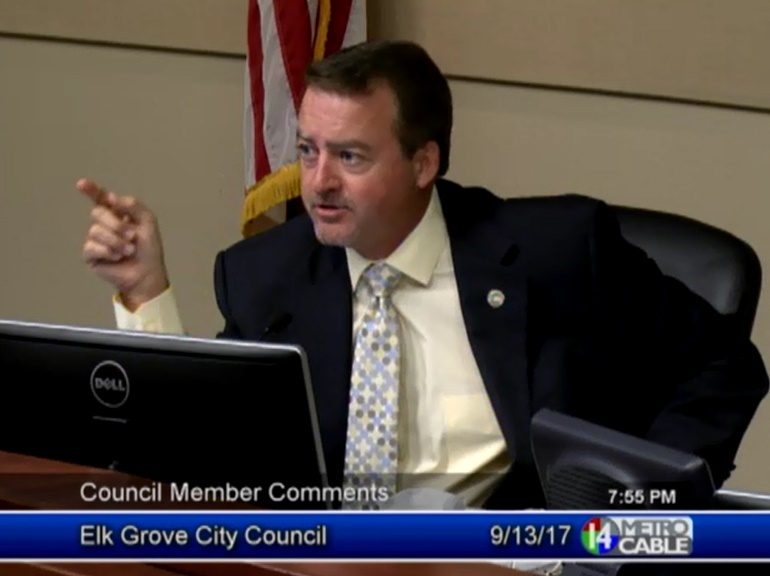 At the Wednesday, September 13 Elk Grove City Council meeting, Council Member Pat Hume made a revealing statement (see video posted below). Hume's comment was made in the context of extensive public comments about a reported hate crime in Old Town Elk Grove. Addressing comments regarding racism in the city, Hume, the current longest-tenured council member, and longtime resident acknowledged the community's heritage. While he stopped short of saying that heritage was racist, he used the term redneck instead. Although Hume was attempting to address concerns, he also inadvertently brought up another issue worth examining. That would be the City of Elk Grove's motto Proud Heritage Bright Future as well as the seal. If we are going to take Hume at his word, and given he and his family's deep and lengthy history in Elk Grove, does part of this proud heritage include racism and hate directed at minorities? Hume did not come right out and say so, but the message was clear. Which bring's us to the City of Elk Grove's official motto - does part of this Proud Heritage include the redneck behavior referenced by Hume. This heritage included discrimination it all its forms, and racism displayed toward minorities and other marginalized communities of people, the internment of Japanese Americans in the area, the treatment of Miwok people, and others who were all part of Elk Grove heritage? Admittedly the word heritage in a stand-alone use is not necessarily hateful. However, as we have seen when used in combination with Southern or Confederate, it takes on a whole new meaning. So as Hume suggested, given his acknowledged history of Elk Grove's redneck heritage, is this a word that we as citizens want to embrace? After all, it can easily be interpreted as an embrace of the less savory parts of our city's past. One other thing worth considering along with the city's motto is the official seal of the city - an oak tree with part of an elk silhouette. While oak trees have special environmental protection in our state, they, unfortunately, they also occupy a troubling part of California's history, not to mention the history of our country. Has the time come for the Elk Grove community to get together and demand a seal and motto that is more reflective of who were are today, and not glorified, even if it was unintentional, some more inclusive. Perhaps something like Unified * Diversified * Progressive or some derivative. Even though the city is unlikely to refuse consideration using the cost of conversion, nonetheless, given Hume's unique position on the city council and his intimate knowledge of Elk Grove's redneck heritage, perhaps he would like to spearhead this issue and show the world what the good people of our city stand for today, not from its past. Never witnessed any form of racism in Elk Grove, and I've been here since 1989.I think it's easy for people to say there is racism, but when you pin them to an instance they are hard-pressed to come up with anything. Elk Grove has finally come out of shadows regarding racial tension and it is leaders from the South County African American Coalition and others who are no longer going to be silent. That was very evident at the last Elk Grove City Council meeting. What short memories our City Councilmembers have. While Mr. Hume is correct in saying Elk Grove has a redneck heritage, has he and his council colleagues forgotten the most heinous hate crime in Elk Grove's history occurred a little more than six years ago when when Mr. Singh and Mr. Atwal were senselessly gunned down as they were out for a walk? This hate crime occurred in modern day, 21st century Elk Grove, not back in the 1970's or 80's. This dubious heritage still lingers in our community, and as suggested by several people, has been emboldened to come out of the shadows in the last few years. It is with profound hope that our city council has a more meaningful response than try passing the buck on to the city's multi-cultural committee. Time for Mr. Ly to lead, follow or get out of the way.